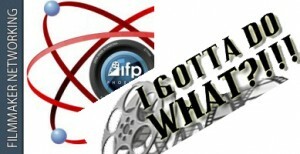 Jon Bonnell spoke at the IFP panel “Filmmaker Fusion – Film Marketing, Promotion, and Distribution” on November 20th. The panel was a discussion on traditional versus non-traditional distribution methods. Taking the non-traditional side was Roze from Mindplate.TV. It was a lively discussion. The discussion was recorded and will available on the official I Gotta Do What?!! website shortly.